Usually I review new and newish books. But today I'm reaching deep into the WayBack basket for an old favorite that I haven't found on Susanna's list of Perfect Picture Books. 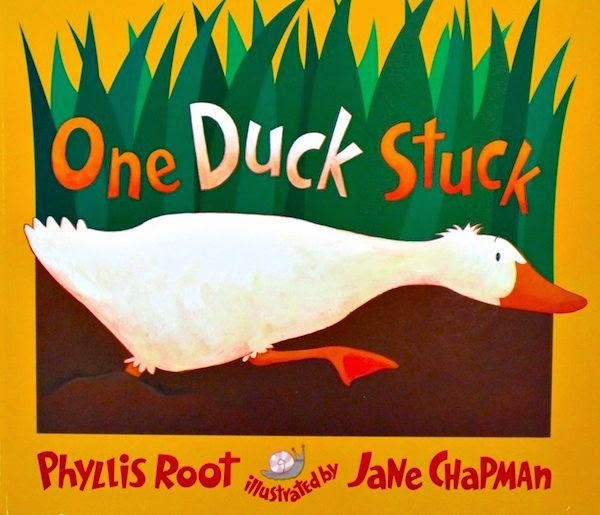 opening lines: Down by the marsh, by the sleepy, slimy marsh, one duck gets stuck in the muck, down by the deep green marsh. Help! Help! Who can help? What I like love about this book: the creative language. Fish splish, moose clomp. Every creature has a word which may (or may not) be in the dictionary. And after tugging and pulling and pushing, the duck stays stuck in the swampy, chompy marsh. Or the pricky, sticky marsh.... each page brings new descriptions for the marsh. I also like that once the duck is rescued, he says "Thanks!" before flying off. Beyond the book: This book features such wonderful language, so why not play with words? Go on a Verb hunt. Verbs are "action words", and Phyllis Root finds - or makes up - the perfect words to show how each animal moves in the marsh. Write down words that show how animals in your neighborhood move about. If you can't find the right word in a dictionary or thesaurus, make one up! Phyllis did. Visit a park or marsh or some other place, and sit for awhile. Observe what's there, how it sounds, smells, feels. Then come up with a list of words to describe the place. In the book, the marsh is described as swampy, croaky, sticky.... What words can you find - or make up - to describe your place? Pick up a pencil and draw. Jane Chapman has fun drawing all the creatures that come to help duck. So when you're out at your marsh (or park or pond) - draw some of the creatures you see. They don't have to look perfect - or even real. And if you want some tips on drawing - or painting- critters, check out Jane's activity page at her website. Today is PPBF (perfect picture book Friday) over at Susanna Leonard Hill's site. She keeps an ever-growing list of Perfect Picture Books. Review copy from my local library. Eighth grade is going to be different, Diggy promises himself. For one thing, he won't name his 4-H calf - he's learned from first-hand experience that naming steers destined for auction never ends well. And this year he'll be less shy around July - now a senior, and the reason he attended his first 4-H meeting. His first resolution lasts 10 minutes, about the length of time it takes to unload his new calf and be rewarded with a pile of warm steer manure on his boots. "Joker!" Diggy says... and it sticks. A name. Within hours his "going to be awesome" year gets another whack: Wayne Graf is left on the doorstep. Wayne's mama died and his real father happens to be Diggy's father - Pops. OK, maybe having a brother won't be so hard after all. Then, Wayne decides he wants to raise a steer and try for the prize: scholarship money. Suddenly Wayne and July seem to be spending more time together and Diggy is on the outside. 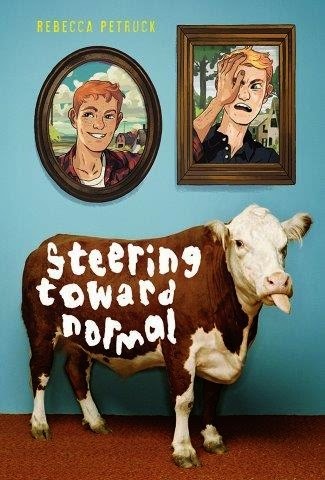 What a great coming-of-age novel, penned by author Rebecca Petruck who has an inside scoop on county fairs, having served as 4-H president herself. Today we're hanging out with other bloggers over at the Marvelous Middle-Grade Monday round-up. Drop by Shannon's blog to see what other reviewers are talking about. Review copy provided by publisher. opening lines: There once was a man named Norman Qwerty... whose ideas were far from ordinary. 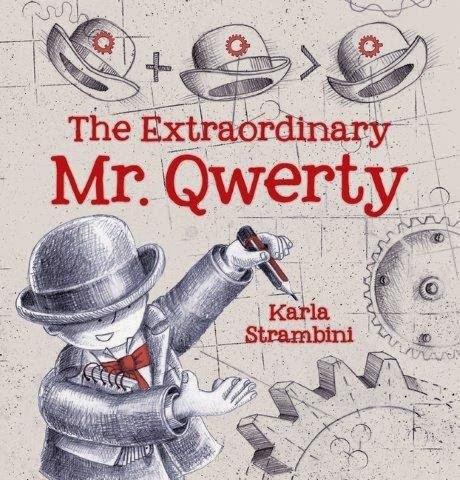 Mr. Qwerty keeps his fantastic ideas under his hat because they are SO unusual that he worries other people will think his ideas are strange. And usually his ideas stay under his hat until one day a very extraordinary idea escapes and grows into something so large and marvelous that something just has to be done about it. What I like about this book: It's plain fun - from the name Qwerty (which anyone who uses a keyboard knows) to the whole "keeping your ideas under your hat" theme. I love that other people have unusual ideas under their hats, too and that, in the end, it takes a group to bring an idea to fruition. I also like the artwork. The black & white illustrations have one or two colors added here and there, so the reader can really spend time looking at the details. They have the feel of architectural drawings: gears, mechanical things. Beyond the book: "Keep it under your hat" is an idiom - hey! didn't we feature an idiom last week? So, what does "keep it under your hat" mean? Make a hat to keep your ideas under. If you don't have a hat, don't worry. You can make one out of a few sheets of newspaper. After you're finished folding the brim and taping it, glue some decorations on it and then think of all the ideas you could carry around under it. Keep some paper & markers handy so you can draw some of your marvelous ideas! One of the ideas under Mr. Qwerty's hat is a flying device. What sorts of marvelous flying devices can you imagine? Draw one and tuck it under your hat. Today is PPBF (perfect picture book Friday) over at Susanna Leonard Hill's site. She keeps an ever-growing list of Perfect Picture Books. Review copy provided by publisher. If you are looking for a book to read this week, then put this one in your book bag. The photos and stories will take you back 50 years to the Selma march. In fact, the book begins with a story of the day the teachers marched - January 22... only a few days from now. It was a scary decision for them, because marching for the right to vote could mean losing their jobs. But they had to stand up for right, and stand up for their student's futures. If you listen to the news, you know that some states are making all kinds of rules about what people need to do to vote: have drivers licenses, or special voter ID's. Those rules, they say, will keep "illegal" people from voting - people who aren't citizens. But if you live in a rural area, the drive to a state office where you can get those IDs could be a long one. And there's usually no public transportation. And if you are poor, then you might not even be able to drive. So the rules end up hurting many people who are citizens, depriving them of their right to vote for congressmen and the president. Back in the 50s and early 60s there were a number of obstacles to voting as well - but they were intended to prevent black American citizens from voting. Obstacles like requiring a reading test, or cutting office hours to only a couple days a week for limited time. Eventually the protests culminated in a people's march from Selma to the capital of Alabama, Montgomery. People flooded in from across the country, and Martin Luther King, Jr. led the march. Or marches - because it took three tries. Finally, on March 25 the marchers arrived after walking 54 miles, to be greeted by 25,000 supporters. 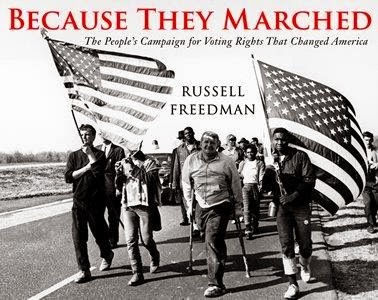 A long walk may not sound very exciting - especially in the rain and cold - but this march put the spotlight on injustice and paved the way to the Voting Rights Act of 1965. It was a great achievement. Unfortunately, voter ID laws created by states over the past couple years are undermining the progress this country made to ensure that every citizen born in this country, regardless of gender or skin color or religion, has a say in how we govern ourselves. This is an important book not only because of the past history, but also because of the time in which we find ourselves. Today we're joining the roundup over at the Nonfiction Monday blog where you'll find even more book reviews. Today is also Marvelous Middle-Grade Monday round-up. Drop by Shannon's blog to see what other reviewers are talking about. Review copy provided by publisher. When I was growing up, I often heard my mom ask, "If you had your druthers, what would you do?" I guess I'd read this book! opening: It was raining. And raining. That's when Dad asks Penelope the same question my mom always asked. And Penelope responds: What are Druthers? Once she finds out , she decides she'd rather go to the zoo than sit around the boring old living room on a rainy day. Dad helps her out by pretending to be a gorilla. She'd rather be a cowboy, or a pirate captain ... and as they play the toys begin to cover the floor until all of them are spread across every conceivable surface. What I like about this book: It's fun. It's silly. I love that the dad engages with his kid - that he gets on the floor and plays. This is a wonderful book to read on a rainy day. Or a snow day. But be careful, because kids will discover, like Penelope, that if they had their druthers it would rain/snow/sleet tomorrow. Make a list of all your druthers. Some folks go beyond list-making and compose entire songs, like this one from the musical, Li'l Abner. 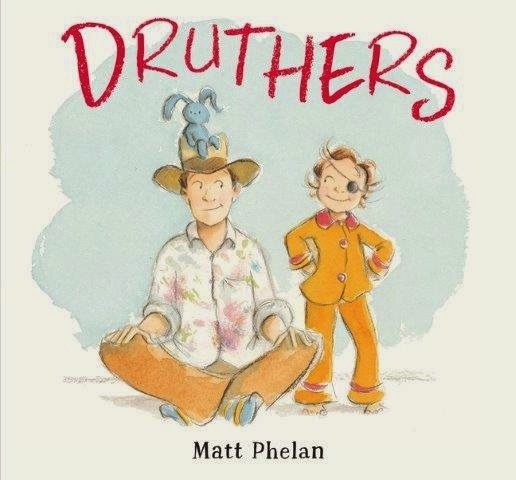 "If you had your druthers" is an idiom. Idioms are phrases that have a special meaning beyond what the words themselves mean. For example: a penny for your thoughts. You wouldn't really buy a thought for a penny.... but it's something you might hear people say. Or they might talk about a book being "food for thought" - though they wouldn't really eat the pages. What are some of the idioms you hear in your neighborhood? You can find more idiom examples here and here. Write your own story that uses an idiom. Or make a cartoon. Or just play around with it and see where it takes you. Starting the year off with two Matisse Mondays in a row is a perfect way to counteract the gray and white landscape outside my window. Last week it was Henri's painting. This week it's all about cut paper. Henri played with the relationship between colors. He played with shapes - those he cut out, and those left behind. Some cut-outs were complex, others simple. Some of his works were small, others stretched across the walls of his studio. .... and then head over to this video of Henri cutting some shapes from paper. And then, grab your scissors and start cutting out your own birds. Or snowflakes. Or try making a landscape. "It's time to go now!" said the bug on a bike. "I better ride over and get Lizard Mike!" So bug - a ladybug (minus 2 legs but it's fiction; who's counting?) straps on his awesome helmet-with-holes-for-antennae and starts pedaling. "Where are we going?" asks Mike. "It's a surprise!" says Bug. And the two of them ride off. Along the way they pick up more friends: a toad, ants, butterfly, dog... they even interrupt a pickle doing strength-training who seems OK with the idea of setting down his weights and following along. Where are they going? Bug won't say. All we know is they're not there yet - until they go uphill, down dale and wind through the forest. I won't tell you where they end up - that would ruin the surprise. But I will say it's fun! And worth the ride. What I like about this book: it's fun and silly and the illustrations are full of things to look at. Like toad's stash of gummi-flies and the carpenter clams busy working on their boats. I love Bug - even though he's two legs shy of an official insect... but I love the long bike-pedaling legs and the green hi-tops that complement the black-dotted red shell. It's also written in rhyme - which makes it great fun to read aloud. And also very silly... because what rhymes with pickle? 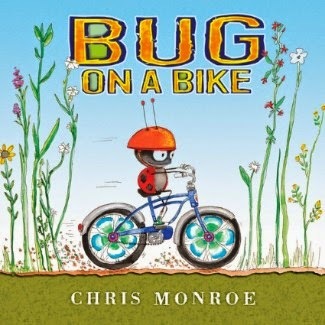 Beyond the book: Bug's friends use different modes of transportation: bikes, skateboards, roller skates, even flight. If you went on an adventure with your friends, how would you travel? Around here we'd probably use sleds and ice skates - what about where you live? Now think about the non-humans that live in your neighborhood. If you went on an adventure, who (or what) might tag along? And where would you go? Make a map - make it as silly as you want to. Where do bugs go in January? Depending on where you live, they could be frozen bug-sicles under the snow, or sipping papaya nectar. Find out where your bugs are hanging out for the winter. Also find out where toads and pickles spend the winter. 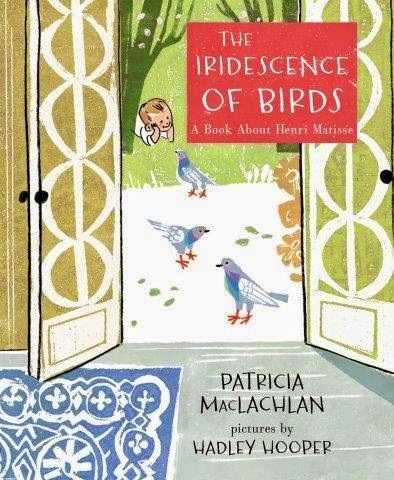 If you come to this book hoping to gain understanding of things ornithological, you might be disappointed because it's a biography of artist Henri Matisse told in two questions - one that spreads over the first 32 pages and the other quite short. But you don't have to read the entire book in one breath. In fact, you'll want to take your time on each page as the story unfolds. If you were such a boy, and you wanted color and light, what would you do? In this portrait of words and art MacLachlan and Hooper bring Henri to life. Color begins to seep into the pages until, by the end of the story, the pages are as full of color as a Matisse painting. This is the sort of book that makes your fingers itch with wanting to paint, or tack warm-colored tapestries on your walls. It will also have you taking a second look at those ubiquitous pigeons whose feathers and feet may have inspired Matisse. The language is spare, the art simplified relief printing, the story inspiring. 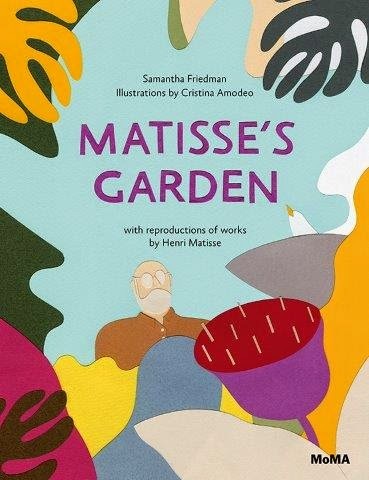 There's even back matter: author and illustrator notes, and a short list of books on Henri Matisse. Curious naturalists can learn more about iridescence and birds here at Cornell Lab of Ornithology and curious artists can check out Matisse's artwork here in his online galleries. You can even learn to paint like Matisse. 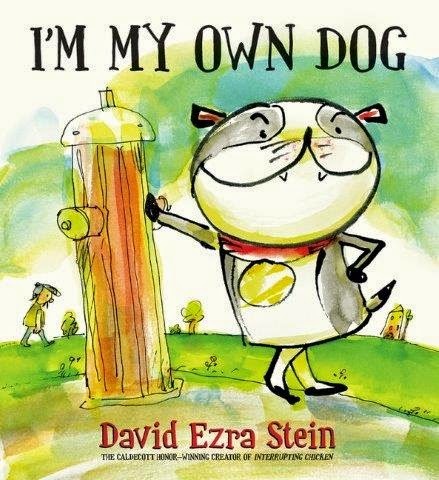 "I'm my own dog. Nobody owns me. I own myself." ... except for one spot in the middle of his back that he just can't reach. So when he finds a person to scratch that spot, he adopts the guy. Then he teaches his human all the things a human should know, including how to play fetch. What I like about this book: I love the point-of-view. And that a dog can teach an old guy new tricks. And the snide comments about human behavior (we're yappy, and messy). But most of all that friendship is a two-way street and based on trust and love. Beyond the Book: There are hundreds of breeds of dogs. What sort of dogs live in your neighborhood? Our neighbors have a pug whose heart is as big as a lion - and who sometimes thinks he is as big as a lion! He lives with three other dogs and six cats on a farm. Dogs have great noses - and can sniff out more smells than we can. Here's a short article about their sense of smell. Some dogs put their sniffers to use by serving in the military. Here's an article- and photos - of "dogs of war". There's no PPBF (perfect picture book Friday) today - but on Jan. 9 we'll catch up over at Susanna Leonard Hill's site. She keeps an ever-growing list of Perfect Picture Books. Review copy provided by publisher.